After the Hospital Stay…What’s Next? After you begin recovering from a trauma by serious illness or a surgery that requires hospitalization and acute care, your medical team will begin to plan your discharge from the hospital. Together you and your medical team will discuss the specific needs you will have when you leave the hospital. Many times, your needs will be simple and you will be able to go home. Sometimes though, you no longer need acute care services, but aren’t physically able to go home. When this is the case the additional time to heal can be done in an SCBHS swing bed. The Swing Bed program is available for patients who need time to get stronger and to participate in a rehab program or other program the medical team has ordered. The Swing Bed Program is easy to use. The only change for the patient under a swing bed program is the level of care. Patients can come to SCBHS directly from other hospital facilities or remain hospitalized at SCBHS. It is common for a patient at a larger metro hospital to transfer to an SCBHS Swing Bed so they can be close to home and family. 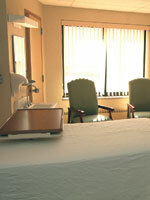 An inpatient at SCBHS remains in the same hospital room and bed. The swing bed patient benefits by fewer disruptions, but still has the therapies and cares their doctor ordered. It’s been proven that patients heal faster when they are surrounded by loved ones. 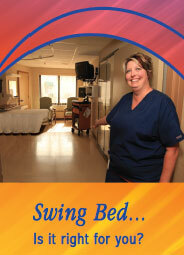 The Swing Bed Program is designed for patients who no longer need acute care, but aren’t physically able to go home. The program offers patients, who are inpatients at SCBH or who are transferring to SCBH from another hospital, the opportunity to stay in a private room at SCBH and regain their strength. Besides around-the-clock nursing care and close proximity to the emergency department, nutritious hot meals are provided for breakfast, lunch and dinner. On the day of their arrival, patients meet with a dietitian to determine their food and snack preferences. Each private room has a private bathroom, cable TV, and Wi-Fi. 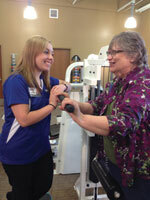 During their stay, patients can participate in Physical, Occupational and Speech Therapies as ordered by their doctor. If needed, specialized services such as, IV Medication Therapy and wound care are available. The Swing Bed program gives patients the extra time to heal after a trauma by serious illness or surgery that required acute care. Payment is often covered by Medicare or private insurance plans. Coverage is the same in most facilities. For additional information contact the SCBH Discharge Planner at 320-843-4232.